Ultrasound examination allows us to evaluate internal organs and tissues through this non-invasive, real-time, diagnostic tool. Ultrasound utilizes high frequency sound waves to generate pictures of what is going on inside the body. Ultrasound examination can be used to evaluate the size, shape, location, internal structure, and function of hidden internal organs. These non-invasive painless exams can detect the abnormal presence of fluid and the differences in organ tissue density for both the chest and abdominal areas. Ultrasound can also be utilized for evaluating the status of a pregnancy and as an emergency diagnostic tool to detect internal bleeding. Ultrasound images may be recorded by our specifically trained veterinarian for review by a board-certified veterinary radiologist. In certain cases we may directly involve a board-certified radiologist who can offer their mobile services at most SVA locations and have a standing weekly visit at our Green Lake Animal Hospital. They provide more involved and specialized examinations plus expert biopsy services on an as-needed basis. Ultrasound-guided biopsies provide a precise and less-invasive means of obtaining deep-tissue samples for evaluation by a veterinary laboratory. In addition, SVA has partnered with a board certified cardiologist, Dr. Jerry Woodfield, to provide on-site cardiac consultations and echocardiograms (ultrasound examination of the heart) at the Green Lake facility. 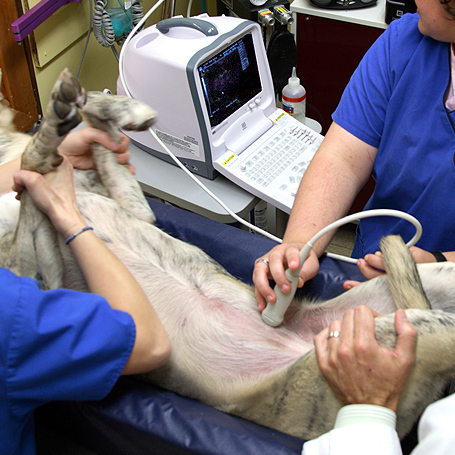 If your pet needs an ultrasound, we can help. Call us to discuss your pet’s care and scheduling options.